Join us for virtual visits to the farm each week when you join Virtual Learning Tours! You can visit the llamas and Connemara ponies of Dawn of Promise Farm virtually every week when you join our Virtual Learning Tours. Step 1: The best way to start out is to add your name and email to our email list so that we can keep you informed of when new video content or worksheets about the llamas, Connemara ponies or rabbits, are going up in the online site. You will also be kept informed of when we will be making live appearances. Get access to our FREE 10-minute video on "How to Halter a Llama" when you join our email list. Click here to see the welcome video and to add your name and email to the list. After you click the button to submit your email, you will be sent to the URL with the "How to Halter a Llama" video. Our llama, L.U.A.s Moonliter's Heartsong, was my assistant for the demo! Background: Vickie has raised llamas for show, fiber production, performance disciplines and companion animals since 2008. We enjoy showing in halter classes and performance classes. In the photo above, you see Vickie with her Classic llama, Betty, along with two of her students: Lindsey with her llama, Armful of Lilies, and Katie with SVL Llovely Llana. You are invited to travel through the pages of the website and get to know the llamas of Dawn of Promise Farm a little better! We hope to see you soon in Virtual Learning Tours. P.S. - Don't forget to join the email list! 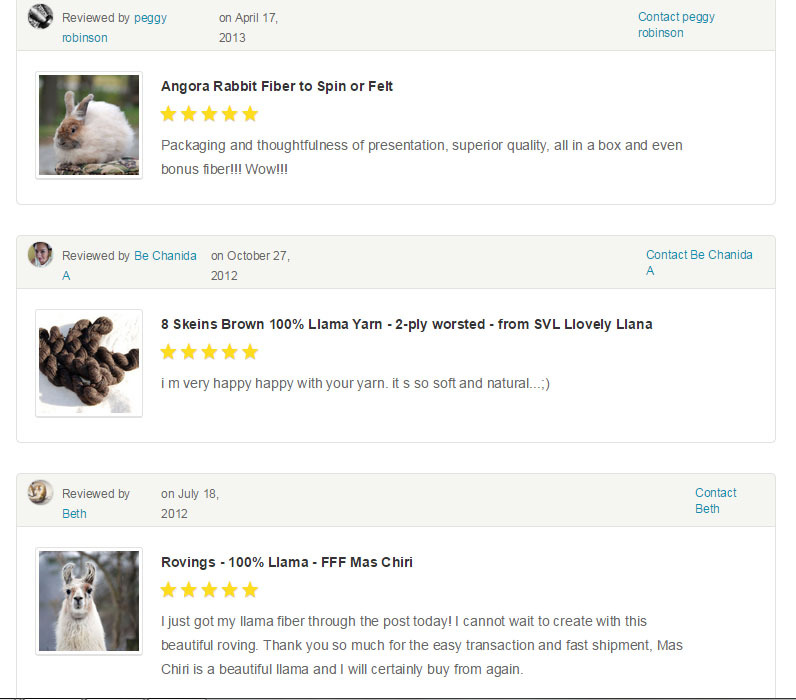 Llama Yarn, Roving, Felted Batts in our Etsy Shop - Check out these testimonials! SOLD - This is our DDH's Gisele who earned Grand Champion Medium Wool Female and Best of Show at the 2011 HLAA Show in Noblesville, Indiana. She is currently standing in the Top 10 in the Nation for points earned in the Adult Female Category for Halter Showing. 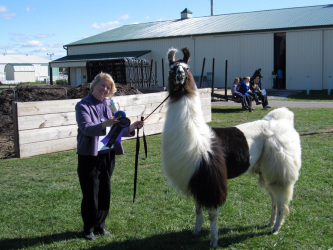 If you'd like to grow your llama herd with llamas of Gisele's quality, please give us a call! 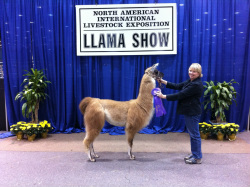 Gisele earned 2nd place in the ALSA Show in November 2012 at the North American International Livestock Expo! Gisele is for sale. You won't want to wait too long thinking about this gal! Lily won Grand Champion of the Walking Fleece Division and Reserve Grand Champion in the Shorn Fleece Division at the 2012 North American International Livestock Show and Expo in Louisville, Ky! SOLD!